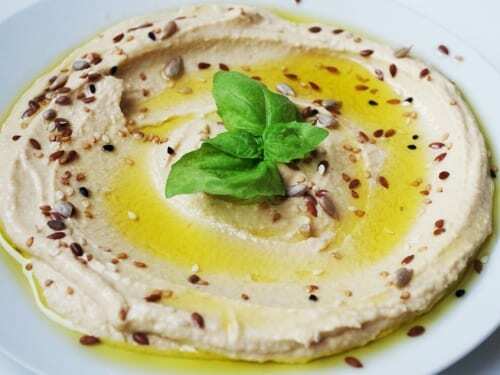 This hummus recipe is part of a series of posts that are focussed on specific foods which have been scientifically shown to improve the health of our guts and reduce intestinal inflammation. Reducing this inflammation may not only benefit gut issues such as IBS, IBD, bloating, pain and constipation but may also be healing for other conditions associated with chronic inflammation. This interaction between the systems of the body is a central concept in Functional Medicine. Hummus may look beige and boring, but the combination of chickpeas, olive oil, tahini, lemon, and garlic creates a versatile and tasty dip. If you have the time and inclination, why not try making it from fresh soaked chickpeas, but canned always work well too. Store bought hummus just isn't the same and will almost always be made with processed vegetable oils, rather than a quality olive oil. Eating chickpeas also increases the number of a bacteria in our gut, called Faecalibacterium prausnitzii, which is anti-inflammatory. If using dried chickpeas (canned are OK), soak chickpeas overnight with a good amount of water. It’s quicker than you might think and it will mean you hummus is a lovely creamy texture. Rinse soaked chickpeas and simmer on the stove for 30-50 minutes. Strain when chickpeas are very soft and place under running cold water to cool. Place the chickpeas in a food processor or blender with the remaining ingredients. Blend until smooth and creamy. Garnish with a dash of olive oil, a pinch of paprika. The beneficial, Faecalibacterium prausnitzii, is a “probiotic of the future” since it produces high amounts of butyrate and anti-inflammatory compounds. It is the most abundant bacteria in the human gut, representing more than 5% of the total bacterial population in a healthy individual. Unfortunately, you can not buy this probiotic as it does not survive in oxygen in the environment outside of the gut. But fortunately for us, chickpeas in particular have been demonstrated to increase the levels of this metabolically active probiotic (1). As although other forms of fibre may benefit the gut as they are devoured by other types of probiotics, they do not increase numbers of F. prausnitzii (2) like chickpeas do. And what is one of the easiest and most delicious ways to get chickpeas in your diet? It’s humus of course! Fernando WMU, Hill JE, Zello GA, Tyler RT, Dahl WJ, Van Kessel AG. Diets supplemented with chickpea or its main oligosaccharide component raffinose modify faecal microbial composition in healthy adults. Benef Microbes. 2010;1(2):197–207.